Looking back, there is little doubt in my mind that if I had had the proper education or information I would have realized my mother was suffering from dementia sooner. Most people like me tend to ignore the symptoms at first believing they are simply signs of “old age”. Anyone who ends up in my shoes knows and understands that a person in the early stages of dementia or Alzheimer’s can function with normality–even drive a car. It is not until they deteriorate or until some “event” takes place that we wake up to reality. 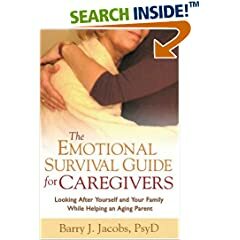 The basic underlying premise in this article is that behavior changes slowly in the elderly and if they begin to suffer cognitive impairment it will be evidenced in behavioral changes. Sometimes these changes can be quite subtle but if detected could raise a “red flag”. If my mother had been enrolled in any of these studies I feel certain she would have been diagnosed with dementia sooner. This would have allowed me to get her in an exercise program, get her proper nutrition, and insure that she was taking her medicines as prescribed. I learned in the last three years how important these three factors are in the quality of her life. 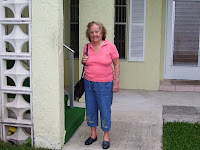 My mother (in the photo) turned 91 years old in June and she suffers from Alzheimer’s disease. I am her CarGiver. WASHINGTON – Tiny motion sensors are attached to the walls, doorways and even the refrigerator of Elaine Bloomquist’s home, tracking the seemingly healthy 86-year-old’s daily activity. It’s like spying in the name of science — with her permission — to see if round-the-clock tracking of elderly people’s movements can provide early clues of impending Alzheimer’s disease. “Now it takes years to determine if someone’s developing dementia,” laments Dr. Jeffrey Kaye of Oregon Health & Science University, which is placing the monitors in 300 homes of Portland-area octogenarians as part of a $7 million federally funded project. The goal: Shave off that time by spotting subtle changes in mobility and behavior that Alzheimer’s specialists are convinced precede the disease’s telltale memory loss. Early predictors may be as simple as variations in speed while people walk their hallways, or getting slower at dressing or typing. Also under study are in-home interactive “kiosks” that administer monthly memory and cognition tests, computer keyboards bugged to track typing speed, and pill boxes that record when seniors forget to take their medicines. More than 5 million Americans, and 26 million people worldwide, have Alzheimer’s, and cases are projected to skyrocket as the population ages. Today’s medications only temporarily alleviate symptoms. Researchers are desperately hunting new ones that might at least slow the relentless brain decay if taken very early in the disease, before serious memory problems become obvious. So dozens of early diagnosis methods also are under study, from tests of blood and spinal fluid to MRI scans of people’s brains. Even if some pan out, they’re expensive tests that would require lots of doctor intervention, when getting someone to visit a physician for suspicion of dementia is a huge hurdle. And during routine checkups, even doctors easily can miss the signs. Bloomquist, of Milwaukie, Ore., knows the conundrum all too well. She volunteered for Kaye’s research because her husband died of Alzheimer’s, as did his parents and her own mother. Measuring how people fare at home — on bad days as well as good ones, not just when they’re doing their best for the doctor — may spot changes that signal someone’s at high risk long before they’re actually demented, Kaye told the Alzheimer’s Association’s international dementia-prevention meeting last week. “If you only assess them every once-in-a-blue-moon, you really are at a loss to know what they are like on a typical day,” Kaye explains. Researchers at New York’s Mount Sinai School of Medicine are heading a study that ultimately plans to recruit 600 people over age 75 to help test in-home “kiosks” that turn on automatically to administer monthly cognitive exams. A video of a smiling scientist appears on-screen to talk participants through such classic tests as reading a string of words and then, minutes later, repeating how many they recall, or seeing how quickly they complete connect-the-dot patterns. An Oregon pilot study of the motion sensors tracked 14 participants in their upper 80s for almost a year. Half had “mild cognitive impairment,” an Alzheimer’s precursor, and half were healthy. Impaired participants showed much greater variation in such day-to-day activities as walking speed, especially in the afternoons. Why? The theory is that as Alzheimer’s begins destroying brain cells, signals to nerves may become inconsistent — like static on a radio — well before memories become irretrievable. One day, signals to walk fire fine. The next, those signals are fuzzy and people hesitate, creating wildly varying activity patterns. The pilot study prompted a first-of-its-kind grant from the National Institutes of Health to extend the monitoring study to 300 homes; 112 are being monitored already, mostly in retirement communities like Bloomquist’s. They’re given weekly health questionnaires to make sure an injury or other illness that affects activity doesn’t skew the results. In addition, participants receive computer training so they can play brain-targeted computer games and take online memory and cognition tests. The keyboards are rigged to let researchers track changes in typing speed and Internet use that could indicate confusion. Finally, a souped-up pill dispenser called the MedTracker is added to some of the studies, wirelessly recording when drugs are forgotten or taken late. Electronics giants already sell various medical warning technologies for the elderly, including dementia patients, such as pill boxes that sound reminder alarms at dose time. And the Alzheimer’s Association and Intel Corp. are jointly funding research into how to use television, cell phones and other everyday technology to do such things as guide dementia patients through daily activities. The next step of companies selling early symptom monitoring isn’t far off, and unbiased data on what really helps will be crucial, Kaye warns. 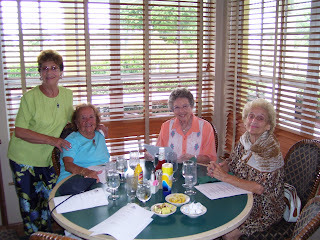 Dorothy is seated on the left in the picture. She is wearing a blue top. Dorothy DeMarco was born on June 29, 1916 in Philadelphia, Pa. Here are some more pictures. Dorothy, granddaughter Kristen, and great grandson Ryan. 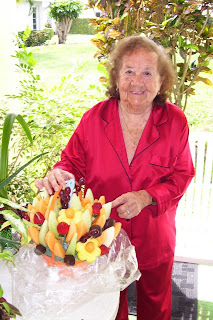 Dorothy received this beautiful fruit bouquet from her daughter JoAnne.